Frannywanny: Hun, what are we doing for Valentine's Day? Paul: Hmm.. oh yeah, where do YOU want to go on Valentine's Day? So much for Valentine's Day surprises from my Mr. Romantiko. Anyway, for couples who are still thinking of where to go tomorrow, why don't you check out Caffe B at Marina Bay Sands? Paul and I recently discovered this place and it has instantly won our hearts with its delicious and beautifully plated specialties. For Valentine's Day, both Caffe B Restaurant and Caffe B Bar have set menus ready for you to enjoy. 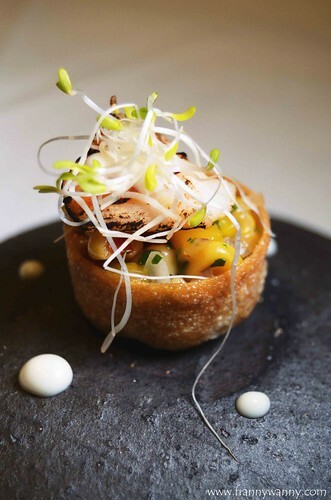 For amuse bouche, we had the Lover's Voyage which is a very pretty assembly of king prawn with tangy mango salsa and served with homemade croustade and yuzu aoili. It's so pretty and I want more more more! The best way to enjoy this is to pop the entire thing into your mouth in one go. Not very ladylike but I'm sure your date will forgive you for it. Moving on, we had the A Spherical Retreat. 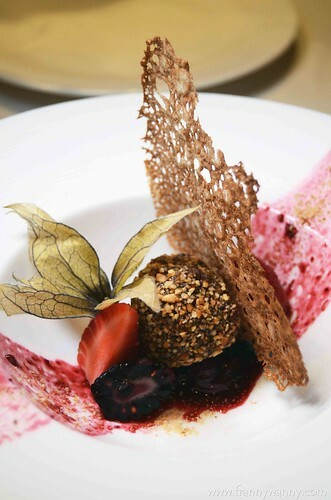 I wasn't really sure what it was when it was first served to us but upon taking a bite, I realized that it's Ferrero Rocher meets Foie Gras thus they call it Foie Gras Rocher! I have to admit that I wasn't too wild about having chocolates for my second course and sadly I could hardly taste the foie gras as the flavor was just too strong. It has an acquired taste to do go for it and see if it suits your taste. I was excited for the next course which was the Chestnut Sweetheart. 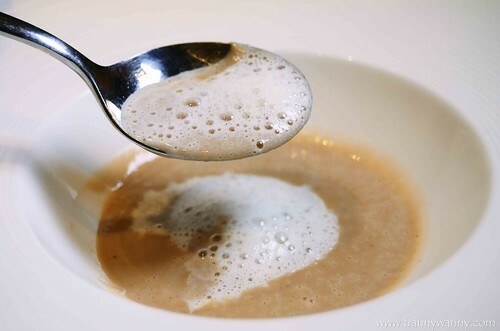 Creamy Chestnut veloute (soup) topped with Alba truffle foam. It's so yummy and I love the strong truffle aroma. As you all know how crazy I am about anything with truffles so this one got my thumbs up sign. How I wish they'd make the serving a bit bigger though as I quickly consumed this in a few spoonfuls. 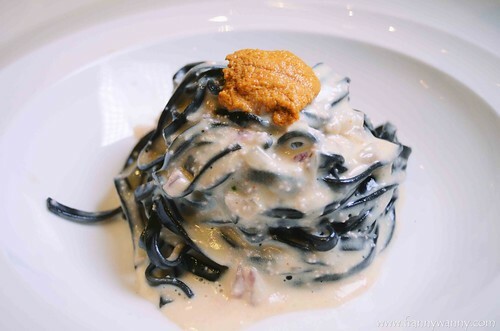 The Ocean's Bounty is a very beautiful creation made out of squid ink Tagliatelle noodles which was oh-so-al-dente! Infused in Mentaiko cream sauce, this creamy and rich pasta dish was topped with an equally creamy slice of sea urchin (uni). I love love love this! The noodles was perfect and the uni and cream were heavenly. It's such a delight to bite into the tiny mentaiko every now and then. Meanwhile, the Risotto Valentine's is another must-try. 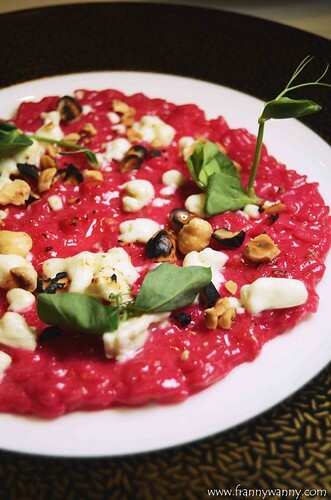 A comforting dish consisting of creamy beetroot risotto topped with torched feta cheese and toasted Hazelnut. It reminded me of popcorn (which I haven't had in 6 years!). I enjoyed the contrasting texture from creamy to nutty and the toasted nuts just gave it a nice touch. Now you know why it's best to just order one of each and share as I can't really say which one is better than the other. I love them both! Moving on to our secondo piatto, we had the Cupid's Steakout which was Paul's favorite. He enjoyed the tender Grilled Wagyu Ribeye which had a good amount of marbling albeit a tad too salty for my taste. It was served with deep-fried Parmeggiano Reggiano Gnocchi which was very interesting. I've never had deep-fried gnocchi before and this one was yummy! 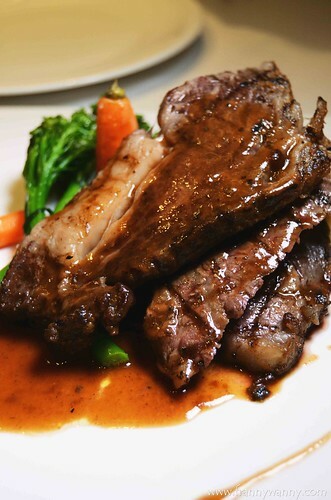 Finally, this dish was finished with buttered seasonal vegetables in Marsala reduction. Over-all, I think the chef went a bit too happy with the salt that it was just a notch too salty to be thoroughly enjoyed. Another option was The Lobster Shack. 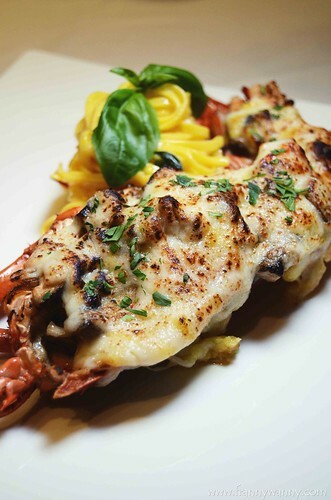 Perfect for the seafood lovers, you'll enjoy this gratinated lobster thermidor served with buttered tagliolini. I love the simplicity of the pasta in contrast to creamy star quality of the lobster thermidor. If given a choice, I'd definitely go with this as the flavor was just right and it was pretty good too. For dessert, we had the Eternal Blossom which was a platter of Rose Bavaroise flavored Ispahan cake of roulade sponge layed in lychee mousse. I have to admit that I hesitated a bit as I'm not a fan of anything that tastes or smells like rose. However, the fruity lychee flavored won me over and the cake was so soft and sponge-y. I'd say that this is a very delicious Valentine's Day set menu which turned out to be very filling after enjoying 5 courses. 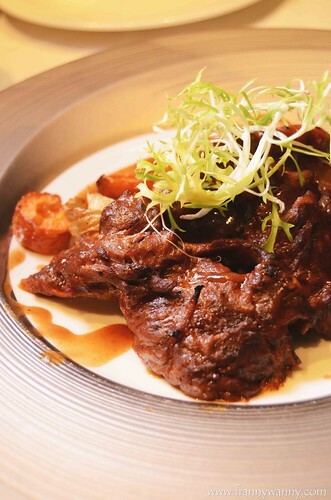 Priced at S$280 per couple, you have the option to add S$80 should you want to pair this with wine too. The menu line-up was simpler here as the goal is for the two of you to unwind and enjoy the beautiful view of the Marina Bay. The bar, after all, has a more laid back and trendy vibe as opposed to the formal and classic feel of the restaurant downstairs. 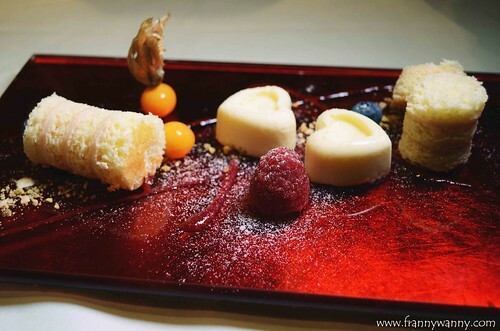 Should you opt to celebrate Valentine's Day at Caffe B Bar, their Valentine's Day Menu is priced at S$120 per couple with an option for wine pairing with an additional charge of S$40 per couple. That means, you're getting 3 different wines to match the 3 courses too. I think that's very reasonable! 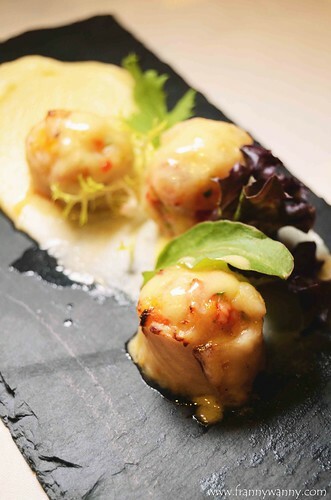 We started with A Hearty Feeling -- a savory starter of dory fish rolled with cubed prawns and bell pepper. It's served with creamy mashed potato in rose white wine sauce. Very very interesting and it reminds me of a Japanese-style appetizer. The mashed potato has a nice smokey taste too. Yum! For our main course, we had the Love at First Bite. True to its name, Paul surely feel in love after his first bite. I don't blame him though as I also enjoyed this plate of braised beef short rib in red wine sauce and served with roasted vegetables. The flavor was just right (not too salty, not too sweet, etc) and the beef melts in your mouth too. As the best ending to our pre-Valentine's Day feast, we had the Jar of Hearts which got me humming on "Tea and Sympathy" by Jars of Clay. Okay, I know that was pretty far-fetched. Haha! Anyway, between the two desserts served that evening, I liked this more. 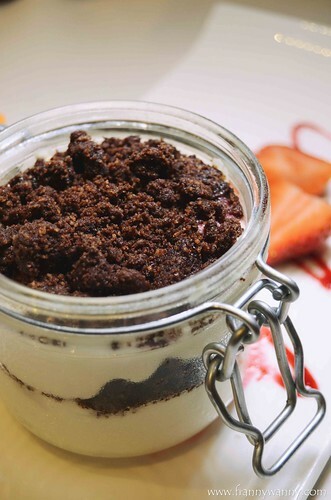 Caffe B seems to love serving their dessert in jars and this one had a nice combination of white chocolate, yoghurt mousse, raspberry coulis, black biscuits and wild berries. It has the consistency of a Tiramisu but the taste closer to a Black Forrest cake.